CIMCO MDM is a paperless manufacturing data management system that helps you manage, control and securely store CAD/CAM files, NC programs, setup sheets, tool lists, quality documents, images and any other production related data. Meeting your high goals in productivity and quality today and in the future requires a constant focus on optimizing your company’s processes and workflows. A strategy for managing information needs to play a central role in any company where getting the right information to the right people and equipment as efficient as possible is crucial. With MDM you get all the functonality you would expect from a modern data management system and then some. MDM helps you centralize all your production documents in one secure place on your network and handles user permissions, backup, restore and revisioning of all associated production documents. Any file or document managed by MDM can easily be located from any networked PC (with the MDM client installed) and sent directly to the shop floor in seconds. This allows for a more efficient workflow where both CNC programmers and machinists have access to all of their necessary data at a glance. Structuring production data in CIMCO MDM works somewhat similar to how files are structured in e.g. Microsoft Windows® with folders containing sub-folders (referred to as Levels in MDM). However, MDM can be configured to secure what files can be added to specific folders and what users have permission to view, modify, approve or delete these folders and files. This helps enforce the folder structure and ensures that files are always placed in the correct folders. By default the root folders in your structure are configured as Project folders and given a project name as they are added. Project folders can then be configured so only Part folders can be added to them. Part folders can further be configured so only CAD files can be added to them and CAM files below the CAD files, etc. You can even configure what additional information MDM should require when a new Project or Part folder is created. In this way MDM provides a highly flexible way to configure and enforce your information structure. 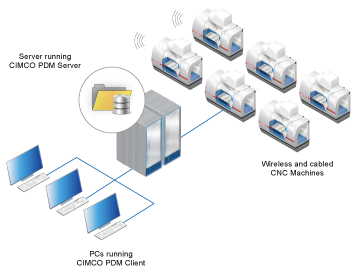 CIMCO MDM consists of a client and a server application. For a minimal setup the MDM client and server can be installed and run on the same standard Windows PC. However, for a large setup the server application can be installed sperately on its own dedicated server and have an unlimited number of networked MDM clients access the server data. So, whether you are a small shop with one or two machines or a large manufacturer with a hundred machines MDM can scale to meet your requirements. MDM can be integrated with a company’s existing applications such as editors and DNC software from many leading vendors. MDM can even tab into other information systems as long as it can gain access to the physical files. MDM can also take advantage of CIMCO software products such as CIMCO NC-Base, CIMCO DNC-Max and CIMCO Edit. If you are already using NC-Base then MDM can be installed “on top” of NC-Base as an extension and continue using the existing database server. Similiar if DNC-Max is installed MDM can use it to send and receive files directly to and from CNC machines. Finally, with CIMCO Edit installed MDM can use it for advanced viewing, editing and backplotting of NC-files. Ready to try MDM for yourself? Call or contact us to arrange a demo, or make a detailed inquiry online.